This weekend Basketball Spotlight will take our yearly voyage to the Mid Atlantic AAU final four. This year’s matchups should be great and Basketball Spotlight will be on hand to bring you wall to wall recaps. Here are some brief previews and predictions. We R 1: The Delaware boys are hot coming off a sizzling performance down in North Carolina. They are the most experienced group in this final and have the hunger to win it all. Jamal Whitteley and Darius Kinnel have been balling lately. 6th Man Warriors (DE); Now these boys are coming to spoil the party. They had an impressive run at the DMV Takeover. Davione Robinson and Ju Ju Hooks are a dynamic duo to keep an eye on. You can’t count these boys out. Team Final: This should be an interesting weekend for Team Final. You would think they have a great shot but I just got word that “The Prince” Reddish will be in Puerto Rico for school. Let’s see how his teammates will step up in his absence. Philly Triple Threat: I haven’t seen this bunch this season but they usually play with that Philly pride and toughness. They will need it if they want to take home the championship Sunday. Prediction: I see We R 1 and Team Final advancing to the finals with the Delaware boys cutting down the nets and taking the title to Wilmington. Team Nelson: The defending champs have had their ups and downs this season. Maybe winning this title will help them regain their steady pace. They will need the duo of Mark Bradshaw and Dontae Scott to step up in a big way. Team Final: The surprise team of the season has been a threat all year long. Now it’s time for them to cross the threshold of champions. The trio of Khyree Temple, Fahmir Ali and Shawn Johnson will be carrying the load. MJ Mavericks: They face Team Nelson in the semifinals and if they want an upset this is the year to pull it off. They will have to play ball control offense and cut down on turnovers. Travis Cumber should be ready to direct traffic in this one. Prediction: I see Team Nelson and Team Final meeting for the championship. Both teams are hungry for a championship but I see Team Final pulling out the win in a brutal match. RIP City: RC impressed us with their play in the AC Showcase and they should keep this momentum going into the final four. Rahdir Hicks runs the show and Kieves Turner provides the scoring punch. They will be a tough out. 6th Man Warriors: They had a decent showing at the DMV Takeover. Now they are trying to steal the Mid Atlantic crown. It’s a tough task but they might be able to pull it off. Team Final: TF won the Blue Division championship at the DMV Takeover. They could be next in line for the regional crown. They have a tradition to uphold. Chester Elite: We haven’t seen this group this year but wearing that Chester name shows they will play with some toughness. 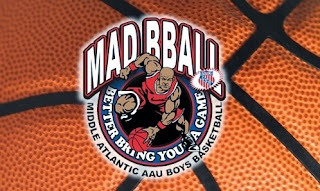 Prediction: I see RIP City meeting Team Final in the championship with the boys from Coatesville, PA winning the crown. Hicks and Turner are just too much. We will get our first look at many of the 4th and 5th Grade teams.